The final section of forest today. We all woke early and weren’t shy about making some noise for last nights visitors as we ate, packed and go moving. It rained solidly overnight and continued to rain as I left the hut with Tom. Jackets on, hoods pulled tight and pack covers secured, we ventured out onto the final muddy section of track, made more challenging with the rain. We only had 2 kilometers of track to walk before hitting a road for a further 2km. We charged through the mud, descending to the road with rain constantly pattering on the outside of my hood. Soon enough we hit the road and thankful to be out of the worse mud. However the volume of water formed several streams along the road and it was still wet. Happily chatting away as we walked and with hood drawn down Tom and I missed the turn off the road to the trail following an historic water-race, completely oblivious to our mistake. It was only when we exited the trees and the road began moving through gorse country that I thought this can’t be right and pulled my GPS out to confirm our location. Sure enough we had overshot by 2.5km. We looked at the options and could have continued all the way to town on roads but where is the fun in that. Turning away we walked quickly back to pick the trail up, adding an extra 5 kilometers distance for the day. We didn’t get fair, maybe 10 minutes, when we saw someone else heading towards us. It was Celistino and he had done exactly the same thing. Continuing on the 3 of us reached the start of the water race track and understood why we missed the turn. 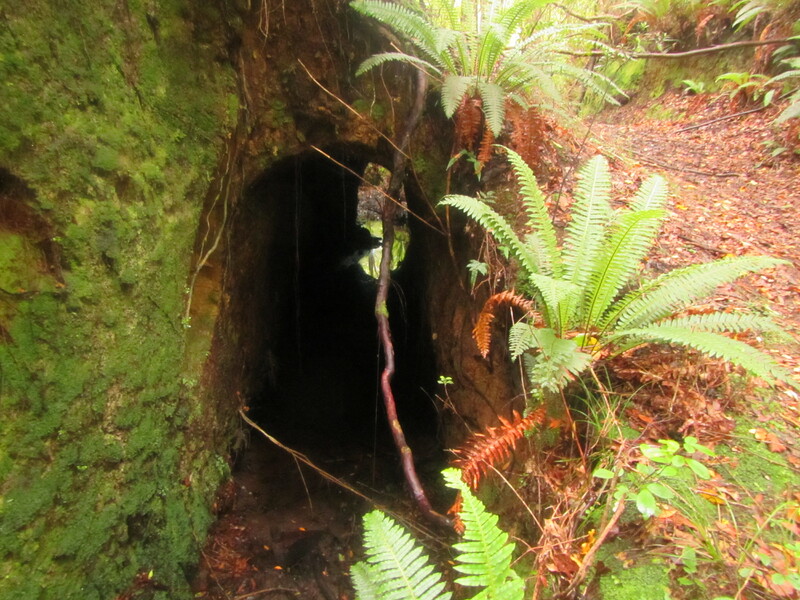 The entrance was narrow and there wasn’t much to give away that there was a track there at all. We found a DOC post and and orange arrow but with hoods down, easy to miss. To ensure everyone headed this way we created an arrow of stick on the road and shifted a direction arrow to the edge of the road so they could be seen. Once underway on the water race track, we split up a bit and played leap frog for most of the morning. 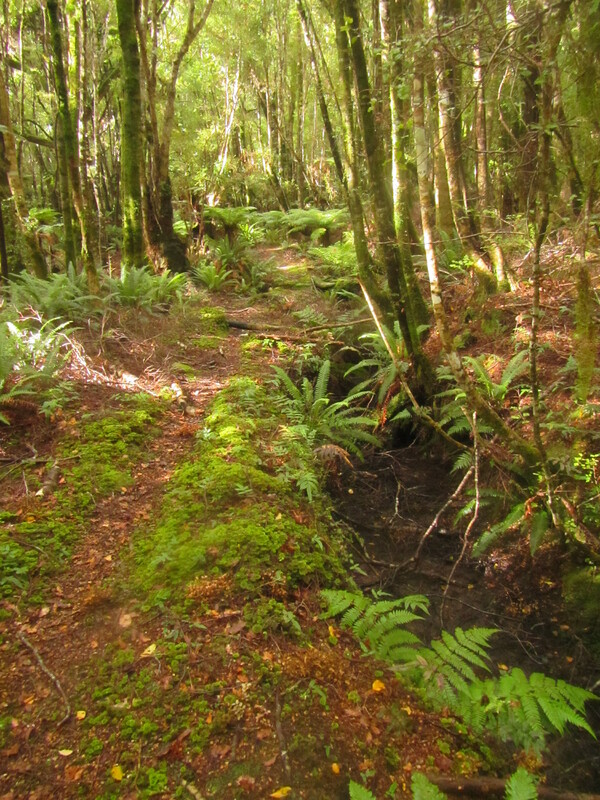 Following the old water race the trail was very level and followed the contour exactly. What could have been a 12km track through the last of the Longwood Forest was in fact doubled that distance, snaking 24 kilometers south towards the highway. I should have played a bit more attention to blogs from last year to get a feel for this track. 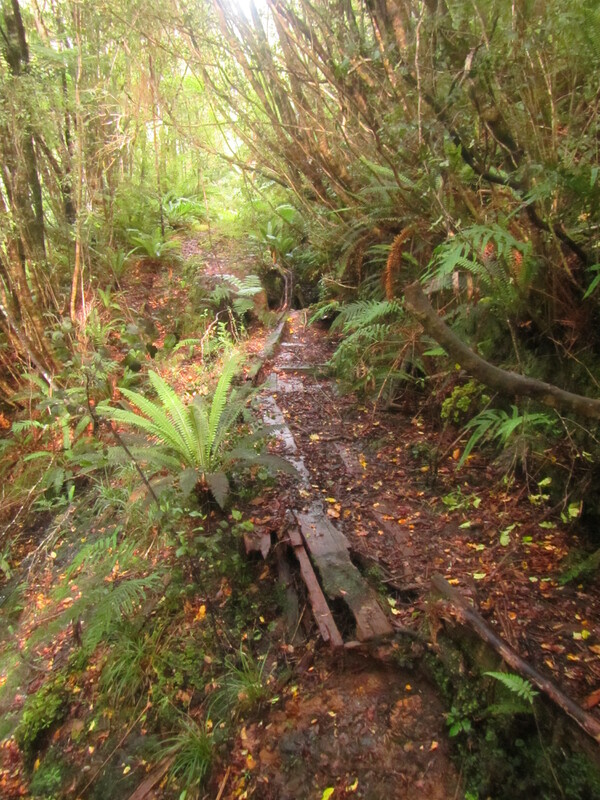 I had it mind that following a water race the trail would be easy. Being an historic section I thought it would be nicely maintained and frequently quite a bit. How wrong could I have been. The majority was flat and fast to walk but there were lots of sections that were not. 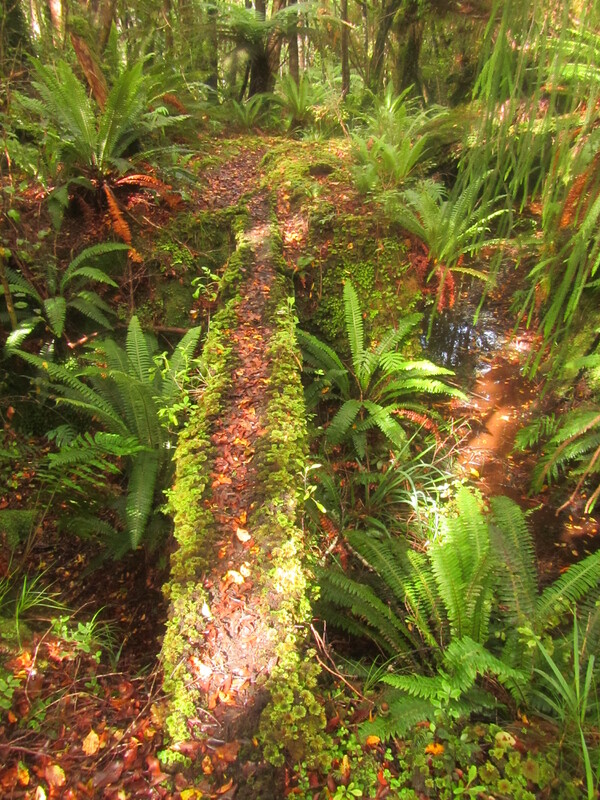 With old timber bridges no longer there, every gully had to climbed down, creeks crossed and clambered back up the other side. 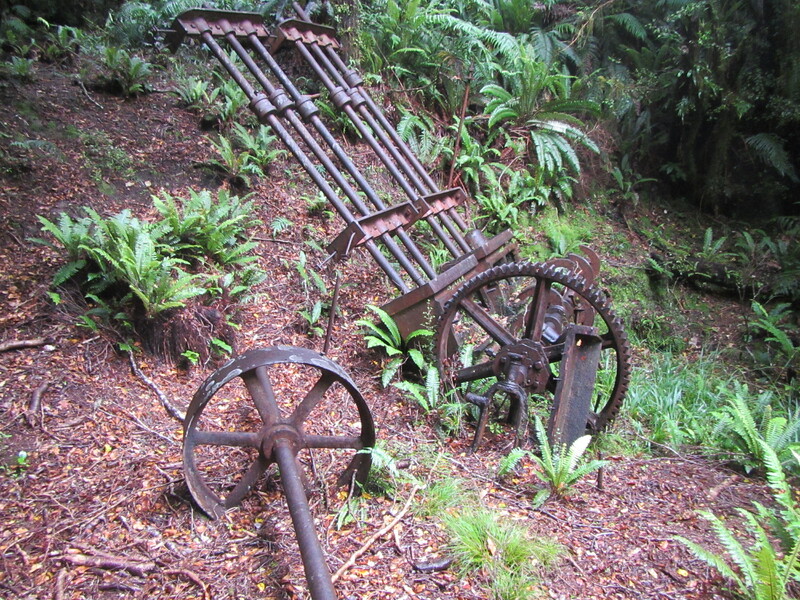 Relics were scattered right along the trail. 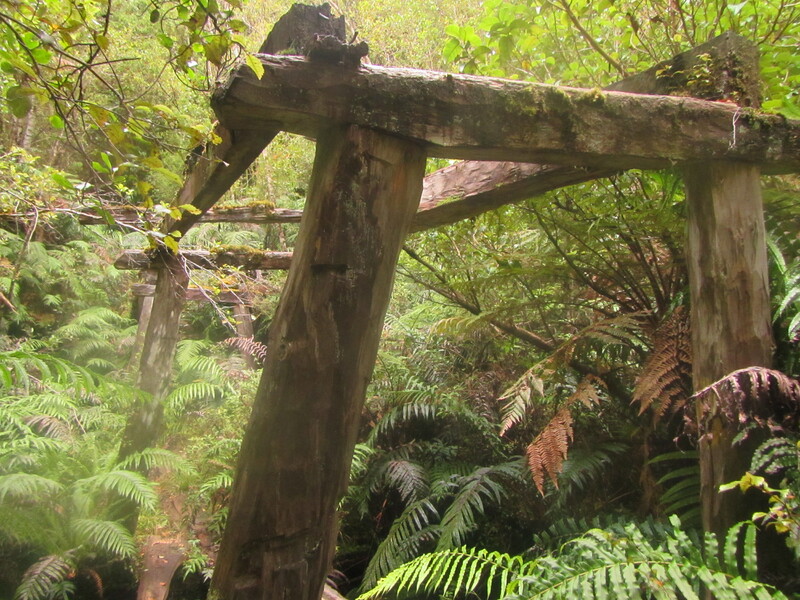 Old machinery, wooden remains of the race itself, collapsed bridges and crumbling tunnels. Progress south seemed really slow on the map though. I’m certain I was walking 3 or 4 kilometers and hour but every once in while I pulled the GPS out to track where I was and it didn’t look like I was moving. The twisting, turning nature or the trail on the contour was driving me nuts. Approaching gullies that could easily be crossed and looking through the forest to the trail on the other side, the actual trail would stay firmly on the contour, taking a wide berth and travel twice as far as necessary. The perfect grade and route to move water but frustrating as a walking trail. As it turned out I didn’t have to walk too much more of it. 13 kilometers in I saw Celestino up ahead having some lunch. I had my ipod in and cranking to get some motivation to move fast and get this section complete. Now apparently he was sitting on a trail junction, the second junction I would miss today. A trail and direction arrows lead off both left and right but I only saw the ones on the left and headed that way. Celestino said something as I walked past but with my music playing I mistook it saying hello and I kept going. I was keen to finish this section and didn’t really pay attention to the direction I was headed either, south east instead of south before swinging to the west. Another kilometer along and I stumbled out of the forest and into a paddock. Apparently I’d taken a marked alternative route. That was alright with me. I’d already added 5km to my trip today and I wasn’t about the back track another one and continue on the water race track. The alternative route turned out to be a public access walking route across private farm land and onto roads. It was another 5 kilometers out to the main highway once off the farm. Walking along the back road towards the highway a really strong southerly had developed. 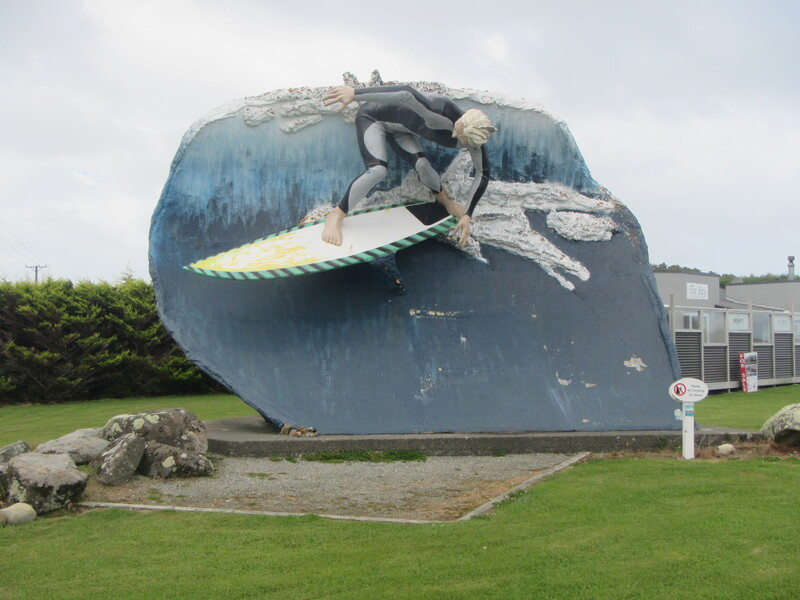 Cold winds and driving rain lashed inland off the ocean only 3 kilometers away as the crow flies and added one last challenge to the end of Te Araroa. I would put the winds well over 50km and hour. They buffeted me left and right along the road. I had to lean into the gusts with a good tilt and then they would suddenly dissipate, the resistance gone I would stumble forward. The backroad wasn’t too bad. The highway? Well that was interesting walking. Normally when walking on heavily traffic roads I would be walking on the right side of the road, towards traffic. It’s easier to see the traffic ahead and move out of the way, rather than walking with the traffic and being surprised by a fast moving truck from behind. But once turning off the back road, the southerly that was a head wind was now at my side. The wind had increased somewhat and it did a great job of pushing me around. Walking towards traffic, the wind would push me onto the road, so I had to walk on the left side with the traffic at my back. I’m sure I provided a few laughs to passing cars as they saw me constantly pushed into the long grass and knocked down at least once. Only a few kilometers of highway though and I was very pleased to reach Colac Bay. Even if I wanted to, I would not be going any further toady. Just behind the welcoming sign to Colac Bay I found the tavern slash holiday park. Luckily they had a room for me as I didn’t want to put the tent up in the weather. The tavern was a fantastic haven for trampers and I’d highly recommend it. They certainly looked after me and others. I got a double bed room for $30 and a towel. I was soon in the shower, shoes and all, loving the high pressure hot water which let me thoroughly clean my shoes and socks, as well as my body. I clean clothes I hit the bar. It was a Thursday I think from memory and what a day to stay. Thursday specials included $10 burgers and $5 pints. Later in the afternoon others started to roll in. Mat, Bella & Rune first off. I told them about our missed turn this morning and my second one in the afternoon. Celistino was next followed by Tom. Solenne and Antoine also showed up but no POD or Disco. A had a great night, filling up on burgers, chips and beer.